It has been sometime since our last newsletter. Be reassure, we have continued diligently to share our Passion for Biking to its full spectrum since. Starting with developing and coaching the next generation of cyclists at the Mattamy National Cycling Centre velodrome in Milton all winter long. Contributing to the Ride for Exuma and helping fund raise for the local hospital. Doing a couple appearances in Montreal for the ACDA cycling club 20th season's launch and the SAS Macogep Aquisio pb Mazda women's team launch. Most recently, we've paired with the St. Catharines Cycling Club and organized the Steve Bauer Classic during the May long weekend. Formerly the Niagara Classic, has been a successful Ontario Cup Series road race held in the Town of Pelham. Among this year's participants, international professionals Ryan Roth of Silber Pro and Leah Kirchmann of Liv Plantur returned to defend their 2015 tittles. Leah Kirchmann successfully earn the women's win and Queen of the Mountain title, while Ed Veal of Real Deal/D`Ornellas captured the men's victory. A big shout out to all of the volunteers and sponsors who made this event something to be proud of. As usual, Niagara was rich in colours with its cherry, peach and apple orchards majestically blooming just a couple weeks ago. The vines are shooting strong and ready to produce grapes for divine nectar. With the return of the stellar weather, it is the start of our Niagara bike tours' season attracting corporate and private groups to get out of the office and the city, and take time to enjoy some of the best cycling routes of Ontario and discover the Niagara terroir. This will be our main focus for the summer and fall including participation to The Grand Ride in September for the Grand River Hospital Foundation and our traditional, but never duplicated, trip to France July 19-25, following the last week of Tour de France. 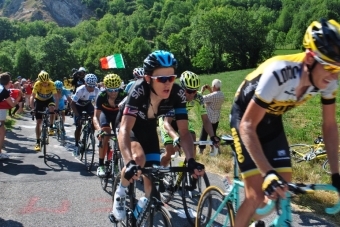 The World Tour is in the final week of the Giro d'Italia making Grand Tour excitement in full momentum. A Columbian, Esteban Chaves, took the lead as the race attacks the Alps. Will this be a new trend for outsiders to begin changing the top of the podium and the ultimate Grand Tour, Le Tour itself? We will know very soon. Until our next cycling endeavour; drop us a line. We'd be happy to hear from you or set you on your next cycling destination. July 19-25 Signature Trip France - Join us in the Alps. Hurry some place available. August - October Niagara - Book your next corporate cycling experience with us! 2017 The Classic & Beer Signature Trip in the hearth of the region Steve called home during his pro career - West Flanders.